Last year was a breakout year for the solar-power industry, as businesses large and small around Virginia began to realize not only the sustainability aspects of installing a solar power system, but also the real potential for financial returns through energy savings – and taxes. Indeed, owners of a solar electricity system can utilize the 30% federal tax credit and use accelerated depreciation to maximize their returns. In recent years, Virginia Community Capital and our banking subsidiary, VCC Bank, has invested in several solar projects, including flexible loans to businesses, utility-scale projects, and solar projects with power purchase agreements. To date, we have closed more than $7 million in clean energy loans. Our largest project of the year was backing a $2.3 million loan to E2C Solar to support a solar array on the campus of the Carilion New River Valley Medical Center. This ground-mounted solar project includes approximately 4,000 panels that will be used to generate nearly 20 percent of the hospital’s annual energy requirements. The hospital will use the energy from the solar system. In November 2017, we closed on a $300,000 loan for the installation of a large rooftop solar power system at Patton Kiehl Group Inc. in Caroline County. The company offers data processing, list management, and direct mail printing and advertising and postal services. Even the horse industry is getting in on the solar action. We supported a 10-year, $123,000 solar loan for the installation of a rooftop system at the Piedmont Equine Practice, a horse vet clinic in The Plains in Fauquier County. As a mission-based lender, part of our focus at VCC Bank is not only on the financial return, but a nod to the future knowing we must invest in clean, renewable methods of power generation to reduce water and air pollution. These projects also create high-paying jobs and a new industry in the process. Our solar experts can also offer third-party guidance to buyers to ensure you’re getting exactly what you’re paying for. 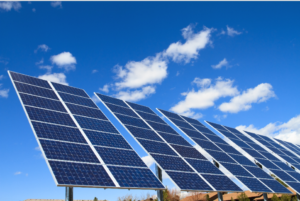 Learn more about some of the considerations to make as you look into solar power for commercial use in a recent LinkedIn article by Bill Greenleaf, VCC Bank’s Solar Energy & Commercial Real Estate Loan Officer. And reach out if you’d like to discuss your own renewable energy future. Learn more about our Clean Energy Lending.